If you send a lot of the same kinds of emails over and over – pitches for work, your contact information and the like – you need to take a look at ToutApp. We covered this service when it launched its browser-based version two months ago and now it’s come to the iPhone. 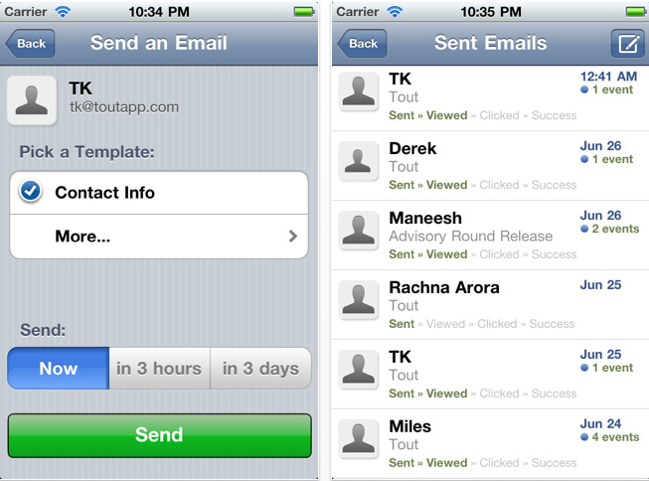 The idea with ToutApp in the browser is that you set up templates for emails that you send regularly. When you want to send one of the templates, ToutApp fills in the details like the name of the person you’re sending to automatically. You can then tweak the email with personal touches if you like, before sending. You also get analytics on open rates of the different templates, helping you to find out which ones work best. 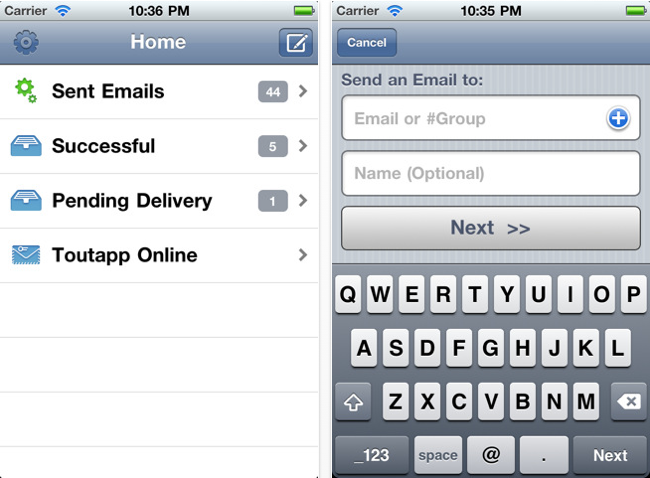 ToutApp on the iPhone streamlines the experience for users on the go. You’ll still need to use the browser app to set up your templates but then sending them from wherever you are is a breeze. Simply fill in the name of the intended recipient and their email address, select which template you want to use and you’re good to go. The email can be sent immediately or scheduled for later. Emails are sent via ToutApp’s servers, so even if you select the immediate option, it may take a short while to actually go. However, you can safely close the app as this is all done server-side. Part of the appeal of ToutApp is the way that you can set up custom variables for things like ‘Product name’ if you’re pitching something you’ve built. At the moment, the only variable supported by the iPhone app is the name of the recipient. This means that you have to be careful which templates you send. Any other variables in them will be sent as-is (e.g., “I’d love you to check out [Product Name]”). If you’re not careful, this could be embarrassing. However, the startup’s founder, Tawheed “TK” Kader, says that additional variables will be supported soon. The ability to edit templates on the go is currently missing too, so if you want to break from the standard email you’ve got set up, you’ll have to head for the browser. These caveats aside, ToutApp for iPhone is already a fast and convenient way of sending canned emails on the go, and we can expect it to be updated with additional features in the future. It’s available on the App Store for $4.99 or local equivalent.